I've covered this at more than sufficient length elsewhere, but I still get asked about lighting in Iray, so I wanted to do a quick set of text basics for those who have trouble ferreting out the relevant bits from the videos. So I made a cruddy peril comic on my other deviantart, and in the process I discovered that the font I was using had pretty bad kerning and the S and G were very similar to each other. I went looking for other fonts to use and found that a lot of people are asking $30-$40 for use of their fonts, which is delusional when I know I need several. Using a personal-use-only font is out too, because there's no way to tell on my computer which fonts are commercial-friendly and which aren't, and when I have hundreds of fonts there's no way I'll ever remember. I could use a personal-use-only font on a product by accident and get in legal trouble. So I ended up on 1001fonts.com. They have a lot of different licenses there, but they do have an option to search by license, which is awesome if you want to find fonts that are free for commercial use. I ended up taking away around five that should work for my purposes. This has been requested more than once, and I'll probably have to delete and repost it periodically to keep it from falling out of sight over and over again, but at least this gives me a place to link. I tried to watch the Shannara Chronicles on Netflix. It looks gorgeous and sounds awful. There were 20th Century colloquialisms galore. What does a non-professional writer know about writing a television script, you ask? Nothing. But I know a lot about being an ardent paying consumer of fantasy media. So if the writer of fantasy content wants to keep getting money from people like me, this is a valid set of criticisms. Many of the worst-reviewed and hardest-failing fantasy films of recent years have rested on modern vernacular to a dreadful extent (Dungeons and Dragons and Eragon being two egregious examples). I'm not going to give a "bad" example, because a lot of people who do terrible pinups are enthusiastic hobbyists, and there's no reason to hurt their feelings when they're really not trying to do this professionally. Still, one can always do better. The reason I'm going to talk about this is that pinups are a perennial visual topic in our medium, and one that is very often done very badly. 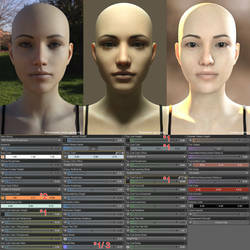 Previously I did a journal entry on the elements of a great storytelling render in 3Delight, which you can find here. A vast majority of artwork rendered in Poser and Daz Studio is either somewhat formalist in the sense that it's still roleplay portraits, or else it's just a series of bad pinups. I have a different article on what makes a better pinup. It's been a while since I did one of these, but today RawArt3d put up this render. This technique also works with things like Jepe's Jewels and Tears (don't do the culling method suggested in "Refinements" if you want to use a transmapped product). It's a kludgy workaround, but it's free. I may do a video or I may not. I've been ill and my voice is still not at 100% yet. If I do I'll link it here. Here is the YouTube version of this tutorial, and here is the accompanying tutorial on using Canvases. This was updated on 4/10/19.